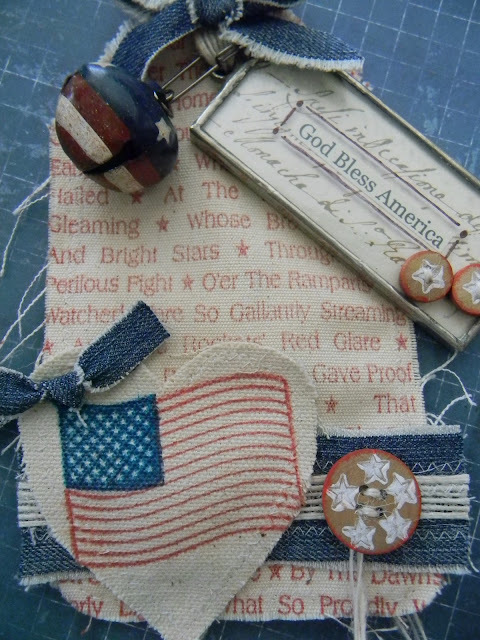 The Artful Maven: God Bless America! 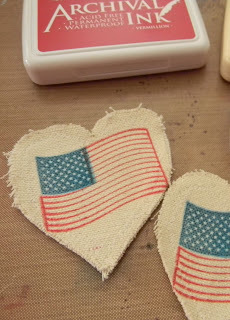 Happy Independence Day fellow American crafters!!! 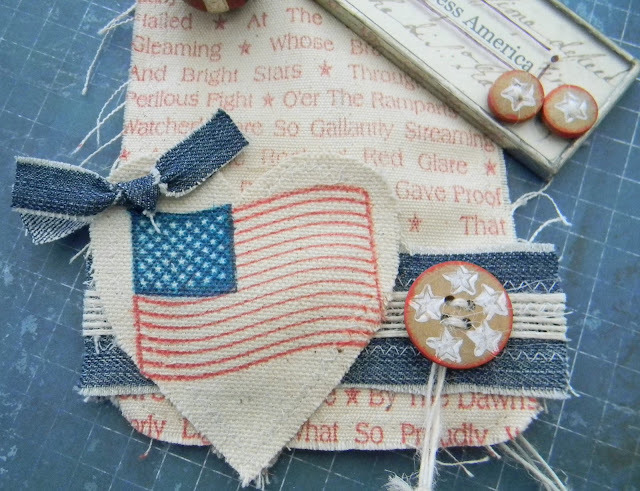 I am so thankful for the freedoms we share, and I love this creative country in which we live! And to the those crafty friends from other countries (most of which I am dying to visit), I am hugely thankful that we have bridged the gap and can reach out and build relationships with each other. We ALL have the right to craft! It's ALL about freedom for ALL of us! Freedom to make what we want with our own hands and share it with the world...something we are ALL thankful for I am sure, no matter what country we hail from. I treasure this immensely, and wish blessings for All of you! Enough with the emotional speech now! It's time for the Funkie's to show their stuff for this fortnight's Frilly & Funkie challenge. The challenge being hosted by the super talented Sue Carrington of Stamping Sue Style, and Sue wants to see "Texture". 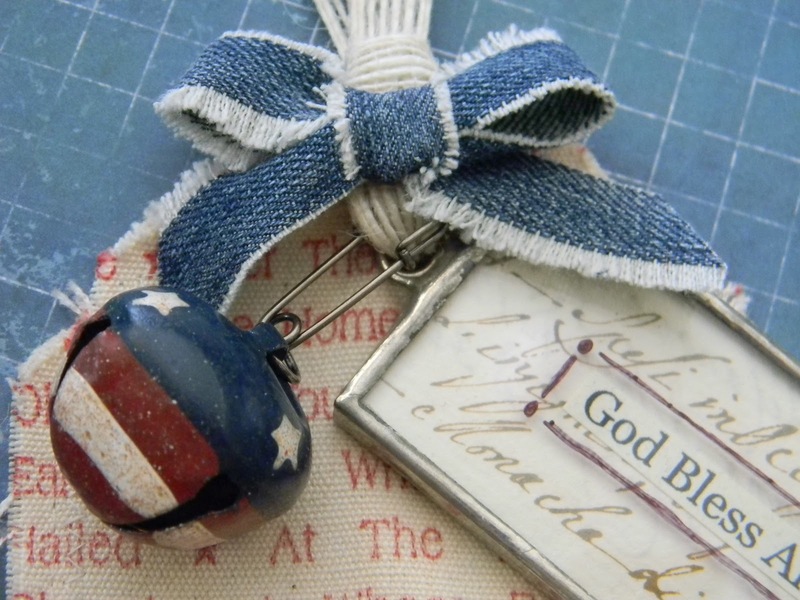 Sue says, "I love using different materials in my craft projects, and I love all the different textures and depth they create." For this challenge we want to see lots of different textures in your project, BUT with the added twist that one of them has to be material! Beautiful creations have been done by the F&F Design Team! All ganders and comments are much appreciated! I know, I know...it's more frilly than funkie!!! I just couldn't help myself. Once I started sewing, I started adding bows and hearts...I just had to! 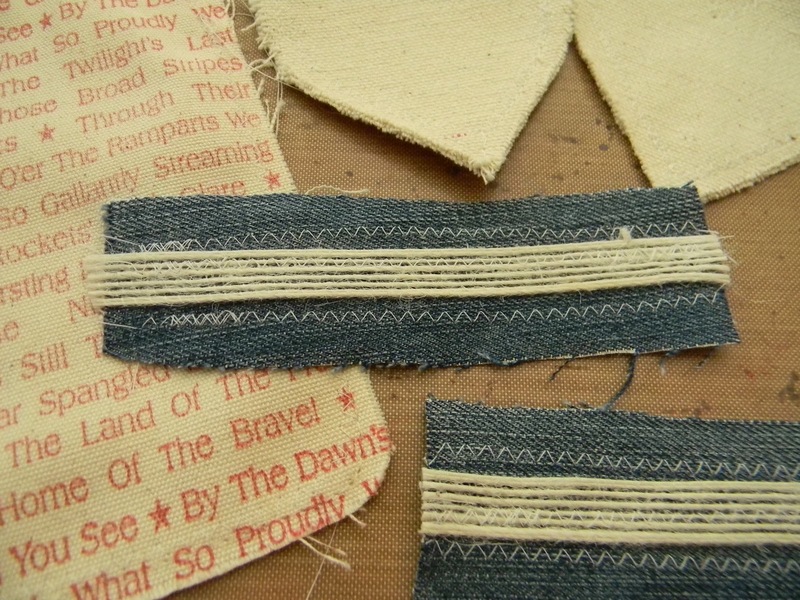 And of course, here is more denim. I am SOOOO into denim right now. I found the metal tag at a little junk and antique store around the corner from me. It was perfect for this patriotic tag. I stamped the Star Spangled Banner image onto this canvas tag by Maya Road in Vermillion Archival Ink. 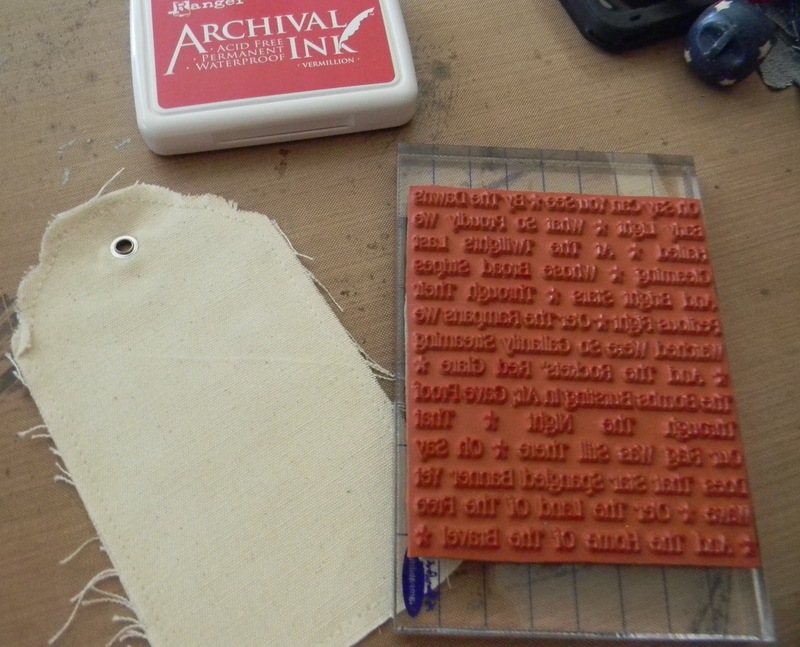 I am loving this deep red....and it's Archival! 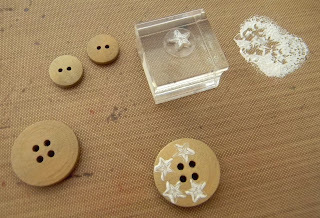 I stamped the tiny stars onto wood buttons, and then gave each button an outline on Vermillion. More stamping with Archival Ink...this time in Cobalt as well. You still have another week to upload your projects to F&F. I hope you all play along! Wow, that's a fabulous tag, great textured background. love the tag, but that bell really captures my attention. it is so beautifully painted. Back to your tag! I love it, if I could stroke it, all you would hear is "oooh, oooooohhh.." :) And the bells are so cute - you should take a video, so we could hear them. Happy 4th of July, have a lovely day. Ты-патриотка!!! Настоящая патриотка! ....Да, я опубликовала новый пост. Посмотришь? This is so sweet! I love the textures, the details, your choice of stamps. And did I mention the details? Great design, Anita! Happy Independence Day! Great tag! Love all the texture and sewing. OMG....This tag ROCKS!!!! 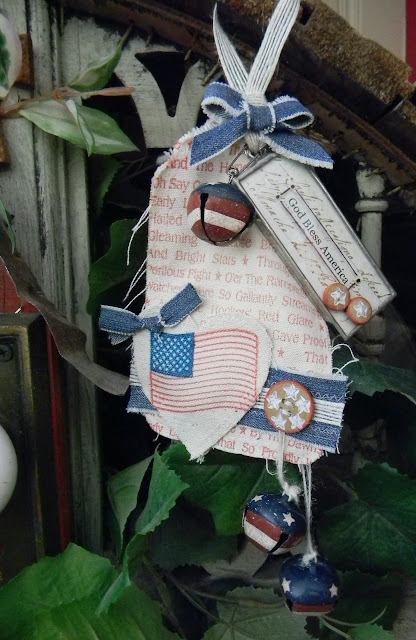 I absolutely LOVE all of this detail......that is a keepsake for sure!!! Fabulous details, Anita! 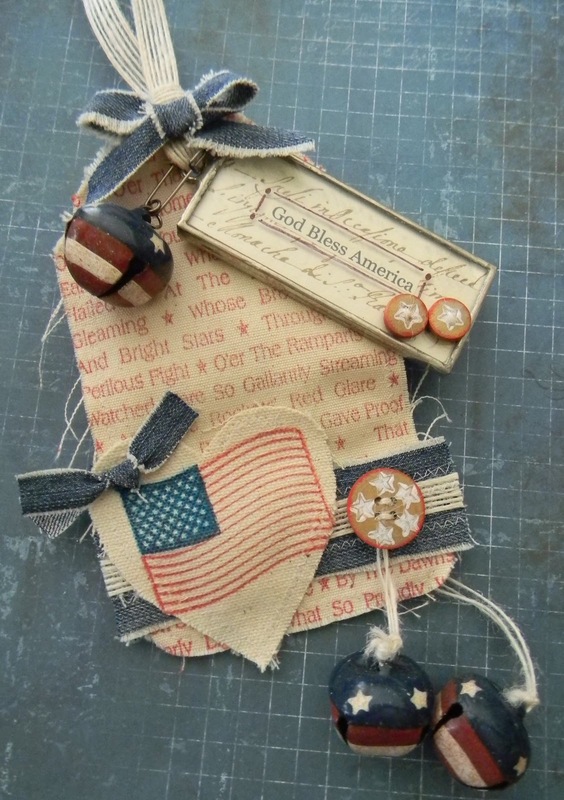 What a great project and so perfect for the 4th! Love it! Happy 4th of July! Love your fabric tag! I can see why you are into denim right now! Love those denim bows! Happy 4th of July to you! Hope you're having a great time celebrating it! Well that's sure taking patriotic to a whole new level! 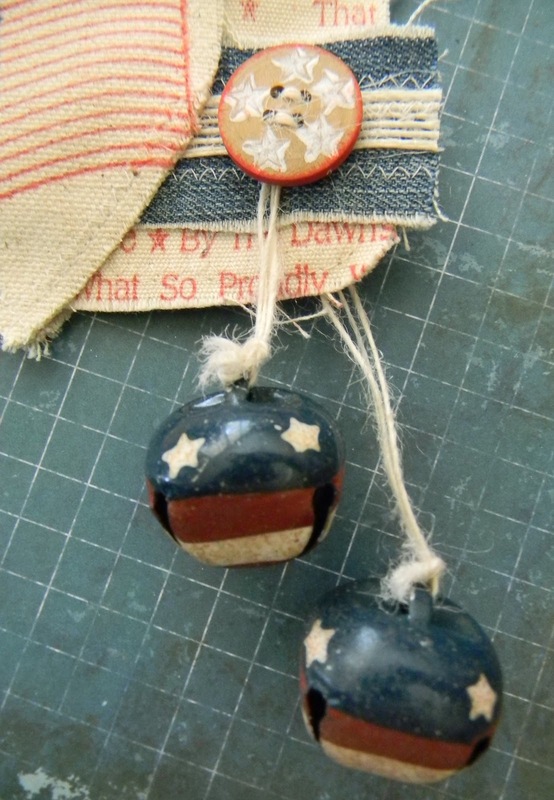 Love the sewing and especially the RW&B jingle bells... Great idea!